Probably our most popular item - apart from the Dingoes themselves! It’s a bucket, a blade, a grab and a leveller! Operated with skill this will be one of the best attachments you’ll have for your Dingo. Simply because it can do so much! It can be operated as a normal loader bucket, but it can load into taller trucks or bins because it can empty by opening up the bottom. It can also empty out a sticky load much better. Materials can be dribbled from the bottom of the bucket, thereby helping to spread them out rather than simply dumping them. One of its most useful attributes. The 4 in 1 bucket is great for lifting and carrying a variety of objects. But be careful! The Dingo has a lot of power and the 4 in 1 can squash some objects. The 4 in 1 pushes a load easily, and there’s lots of ways to do this. Experiment and find the method which suits you. We find one of the best methods is to keep the front of the bucket out in front pushing the top off, and the back of the bucket acting as a normal blade - finishing the job. 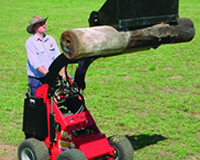 With the jaws open and with the open edges near to the ground the 4 in 1 can be dragged forward and backward for level-ling. The bucket bottom helps to break up the lumps and the back edge smooths them out. This isn’t as good or as easy as the dedicated leveller, but it’s certainly an added bonus to a very useful attachment. Using the dedicated leveller attachment can also be made easier with the 4 in 1 bucket - All new levellers come with pick up points for grabbing with the 4 in 1, so to use the leveller you just grab it and go! plumbers, National Parks, Councils, & Hire Companies.